The narcissist doesn’t feel bound by the same rules we do. The tactics they use to manipulate us are unfair and duplicitous. The narcissist’s disordered personality does not allow for open discussion, honest sharing, or the normal give and take of healthy relationships. 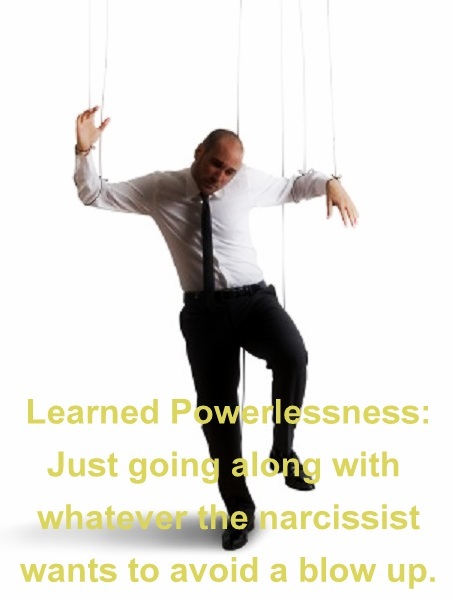 When the narcissist is performing the disappearance act, the instability of their mood, the unreliability of their presence left you feeling alone and insecure. These feelings can connect you to another time in your life where you felt alone and insecure, amplifying your anxiety. When you mention your feelings of the impact or the narcissist’s departure, you are shut down. You’re called names, told you are insecure for no reason (as if you suddenly started acting insecure in reaction to nothing) and let you know what a bother your feelings are; which further increase your sense of insecurity. Even though they blame and shame you, this isn’t an internal insecurity, it is insecurity about the reliability of this relationship and the narcissist. When narcissists ask for your opinion, they do it to engage in battle rather than engage in conversation, they can be downright intimidating. They coax you into the water, only to find that you’re having your toe bit off by a piranah. You start to realize that the narcissist doesn’t ask for your opinion to really HEAR it, they elicit any kind of input from you to do two things: CONTROL AND BELITTLE YOU. This reaction serves to teach you that in the future – your input will not be valued nor required. Just sit there and look pretty. I often told the narcissist that abused me that he treated me like a vase on a shelf. Pretty to look at, well placed and permanently available to him to pick off the shelf whenever he needed something from me. I was not to have a life outside of being that vase that couldn’t move. When the narcissist goes back and forth between Dr Jekyl and Mr Hyde, your anger and resentment go through the roof! How dare he treat you like a subservient object, then waltz back in as if nothing happened, simply because he needs some feel good from you. It’s exasperating. Their pure selfishness and inability to see things from your point of view, is AGGRAVATING! It’s important to get resolve when you’ve had a misunderstanding with a person. You want them to hear your side of things and understand your needs, so that in the future, this hurt can be avoided. With a narcissist, it falls on deaf ears, because their ONLY reason for wanting a disagreement to be over, is so their IV drip of honey from your arm, is uninterrupted. How does the narcissist manage to turn on the superficial charm again and again while abusing you simultaneously? And why do we fall for it time and time again? It’s not because we’re foolish, it’s because we want to be loved, it feels good to be cared for, to have the love we feel for the narcissist returned to us, its nice to have moments of kindness even if they’re short lived. To suddenly have the narcissist turn on us while we’re least expecting it, is a truly unfair and cruel provocation. The Devil’s advocate tactic is a way of elevating their unique and special form of knowledge on whatever topic they’re pontificating about. You feel like you’re in a no win situation. If you don’t concede, they’ll keep you up all night proving their point. You just want the madness to stop, so you acquiesce. It just seems easier. Your feelings can resonate back to those of a child, how powerless children are to have any say in matters of importance, and with a narcissist, of non-importance. If you learned to subjugate your voice to a narcissistic person in your past, you’ll surely do it again in the presence of this narcissist’s sheer will to be in control of EVERYTHING; even your opinions. Posted on October 5, 2013, in Narcissism. Bookmark the permalink. 16 Comments. been split up nearly a year now and still being controlled sad that we have a 3 yr old together as i feel i will never be set free from her controlling ways. i do everything to prevent any confrontation with her i feel the nicer i am the the worse she is to me. i lost my mum last November oh my gosh she just fed of my misery and loved every minute of it she even said she was doing me a favor having her son whilst i attended my mums funeral .my son lives with me yet she she messages when she feels like to ask if hes ok and if i dont reply immediately she starts sending me ??? until i answer shes gone but i still feel sick every time she starts messaging or phoning. she phones to speak to my son and some times he says i dont want to speak to her if hes watching cartoons or eating but she starts getting all shirty saying will you make him speak to me please my heart starts going for fear of her blaming me for him not wanting to her as she do regular. she took the family car when she left didnt argue just let her take it it was in both our names on finance she hasnt been paying they sent letter saying car has not been payed for 4 months. i phoned her to ask whats going on she told me to mind my own business baring in mind the car was still in this address and this is where they were coming for payment i could go on and on but this is from a mans point of view as this happens to men too .x. This is absolutely the best description of how the narcissist works. I have been in two long term relationships with narcissists and always walk away from articles unsure if it defined these relationships. This defined them both to a tee. Thank you. Your posts are very informative & full of interesting facts & thoughts. I enjoy sharing your thoughts with my friends/readers/followers. Thank you so much for this blog & all the hard work you put into it! You hit the nail on the head, on all points. Thank you so much. My nine year “relationship” ended in November. I knew it was a bad relationship. The shock to me is that it was an illusion. I (and my therapist) have been questioning why I stayed as long as I did. I have been beating myself up, truthfully. Because I am a confident, fair and loving person. Over the years, my self esteem has been corroded, no doubt. But when I read this, it made me feel so much better. It really answered my question and I will read it to my therapist. I am learning that it would really help if my therapist had a better understanding of narcissism…sigh. I have so wanted to articulate what happened to me but have never been able to come close to even one sentence. I was married to someone with NPD for 29 years. It took four years after I escaped to find out what happened. I knew he had a personality disorder but it was never diagnoised. I have been free for 7 years now. Well, I don’t know if I will ever be free. My 5 children also suffer the effects of my carnage for exposing them to someone who could never and will never love them. By all rights I should be in a mental ward. But by the Grace of God go I. I hope one day to come close to telling what happened but after reading this article it has brought a great deal of comfort to me. Since I trust no one, I have talked to very few about what happened to me. When I try to talk about it there are no words. You are describing my husband to the T. It’s so true everything written here it’s scary. I’m so happy to know that I wasn’t going crazy and there others out there with this same exact messed up mental disorder. I have met someone. He doesn’t want to be touched. Reminding me to respect his boundaries. I understand. But at the same time it hurts me. I feel like he is telling me that I am not good enough for him. We both have issues for the exact problem. I don’t know how to help. So I let him go. I figure that he would tell me if he needed me. Tonia, it took imcredible courage for you to take steps to remove this man from your life. When there is a disability, it would be all too easy to not want to “kick them when they are down.” I stayed many, many years through my Ns illnesses, depressions, unemploymemts. YEARS. Waiting for him to get healthy. He got healthy, then completely arrogant, if not manic. He finally got the good job with the good benefits. Bought himself all sorts of expensive toys. Took up hobbies and filled up his time with activities that didn’t interest or include me. Then I noticed dozens and dozens of selfies on his cell phone. Shirt off, seductively gazing at the camera. He never texted any to me. I only saw them all because he wanted to show me a picture he took and had to scroll through them all. Then around labor day, I had a breakdown. I am suffering extreme anxiety/ panic disorder, phobia and ptsd and depression. I have been off work three months. I feel truly alone. He left after his birthday in November. Some of his last words to me were, “I want out of this but I hate to kick you when you’re down.” All I can think is that I should have left long ago. Better me than him. Your story gives me so much hope. Thank you for sharing and may God continue to bless you and keep you on your journey. You just want the madness to stop, so you acquiesce. It just seems easier………. Yes exactly, it’s sheer madness to anyone who hasn’t been there, but completely rational to those of us who have lived through it. Great article. So strikingly real and spot on, it’s chilling.